For five years Brody brothers has serviced our house in the most thorough, effective, professional, responsive way. Every company should run like them. They are A+!!! Good communication on scheduling this service. As usual, Pablo is thorough and excellent. Thank you. They are always working to figure out how to get rid of our field mice problem. When one method doesn’t work, they try another. You continue to be a consistently a wonderful Company. PERFECT RATING in every way. Brody Brothers has rescued as twice from rat infestation in our Baltimore City home. We were silly to cancel our service plan after a year but a few years later those rats found their way back in. We’re not canceling our contract this time - it’s the only money I don’t regret spending for the peace of mind of knowing Brody Brothers has our backs. All the technicians are friendly and dedicated to providing excellent service. The office staff is quick and receptive. We have only had positive experiences and will continue to recommend this awesome service to all! Very pleased with what they do. We have used the Brody Brothers for many years and have always been pleased with their prompt attention. In every case they have resolved problems and provided advice to prevent future problems. We are very satisfied. Thank you. Staff are professional, friendly, knowledgeable, and responsive. It is a pleasure to work with Brody Bros. staff. Always enjoy everyone from the team at Brody Brothers, very professional, efficient, on time (!) and are great with our two needy bulldogs! I've had a maintenance contract at my Hampden home with Body Brothers for several years. They're both effective and accommodating. Highly recommended for your pest control needs for either spot issues or on a long-term basis. ALL OF BRODYS EMPLOYEES ARE POLITE AND PROFESSIONAL AND GO OUT OF THEIR WAY TO ANSWER ANY QUESTIONS YOU MAY HAVE. THE TECHNICIANS ARE EXTREMELY THOROUGH GOING THRU MY HOME INSIDE AND OUT! We have been with Brody Brothers for 5 years. Always on time, you can have them come out within a day or tw.o. Very knowledgeable, courteous and gets the job done! I’ve been a customer since 2005. I have received amazing service and great customer service consistently! This company has always been efficient, kind, and on time. We used to have a huge ant issue that made me miserable every morning when I would find ants crawling all around. Brody Brothers worked to solve the problem and by keeping to a regular schedule, we have NO ant issues at all. And when we uncovered a nest of yellow-jackets, they were here quickly and totally and solved the problem. Brody bros always comes when scheduled, always flexible if a schedule change is needed and has always addressed any of my concerns promptly. 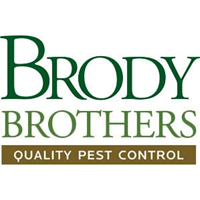 I had a pest problem but since using Brody Brothers, I no longer have the problems. The technician comes once every three months and is very thorough in checking for problems and placing remedies for future problem. I am asked questions regarding the problems and am advised of what to do and what to look for to prevent future problems. I highly recommend the company. I was contacted immediately after posting my review. I was impressed by the extraordinary steps Brody Brothers took to rectify this situation. Follow-up service was good! Thank you for your prompt response. Pablo was on time and very proffesional...we continue to use Brody Bros because of their careful inspections; insightful experience; and friendly staff, both in the office and technicians. Exceptional service. Michael checked my attic rooms since my son thought that he heard something. ALWAYS ON TIME AND FRIENDLY AND NICE. DO A THOROUGH JOB. I was not home for the visit, which was convenient. Based on the report, everything seems to have gone fine. Jon did such a wonderful job , very professional and took care of us very well ! Thank you so much. Wish he would have let me know after the service call as he did tell me he was there to do the service. The response and service was excellent. John came quickly to deal with our vermin problems. He examined all of the potential entry points and determined we had a flying squirrel infestation. He installed one-way cages and traps, all in one visit. We are very happy, once again, with his services. Your technician did his work outside; I did not meet him, but I am confident that he was excellent. Brody Brothers is very professional and extremely thorough. They spend a lot of time outside checking for any possible entrance into our home. They don't just walk around with a spray can like other companies. If we have an issue like a bees nest, they usually come out the same day. The technicians are friendly and professional. I would highly recommend Brody Brothers to anyone. I always have a great experience with Brody Brothers. Every technician has gone above and beyond and is very knowledgeable. This past service Kyle was wonderful. Never had a bad technician or any problems arranging for service! Ari is amazing. So thorough, polite and personable! Michael is always on-time, thorough, & friendly. He takes the time to answer questions and look for entry points to eliminate future problems. We have found Brody Brothers to be both professional and knowledgeable. They care about their customers and their customer's satisfaction. very nice and pleasent was very happy he listened to what we had to say. We’ve been customers of Brody Brothers for quite some time and have always had a positive experience. From the friendly office staff to the knowledgeable technician, our pest control needs have always been met. Thanks for the great service. Everyone at Brody Brothers are dedicated to customer service. I have found them to be very responsive and professional. Always thorough and they sure do know their pests! Very happy with Brody Brothers. Excellent at what they do. Very professional and responsive.